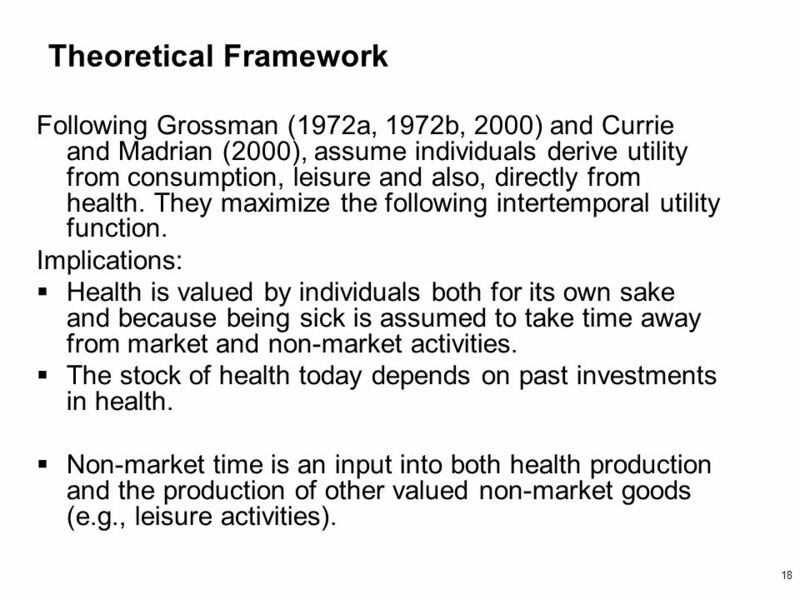 18 18 Theoretical Framework Following Grossman (1972a, 1972b, 2000) and Currie and Madrian (2000), assume individuals derive utility from consumption, leisure and also, directly from health. 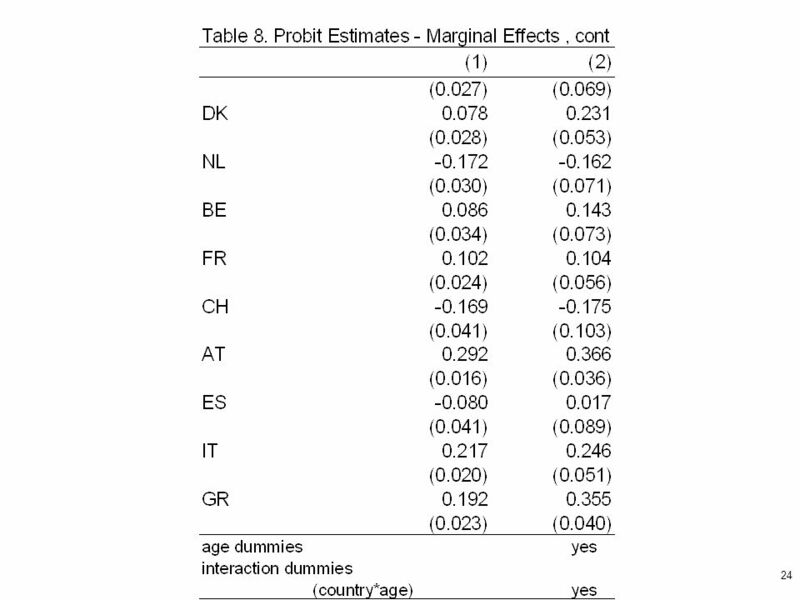 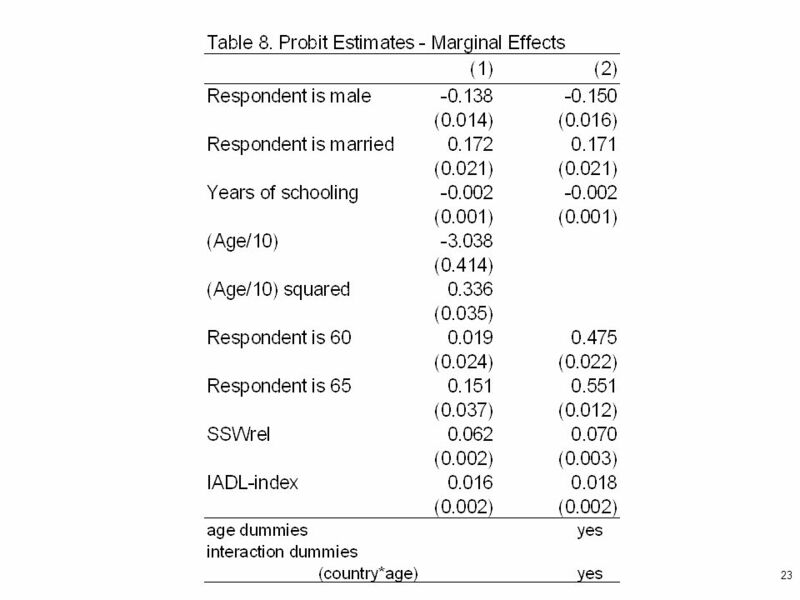 They maximize the following intertemporal utility function. 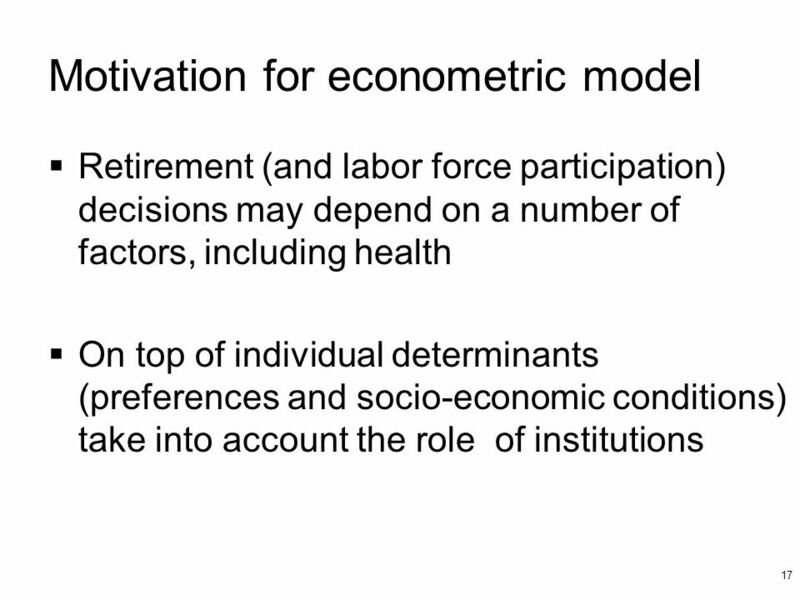 Implications: Health is valued by individuals both for its own sake and because being sick is assumed to take time away from market and non-market activities. 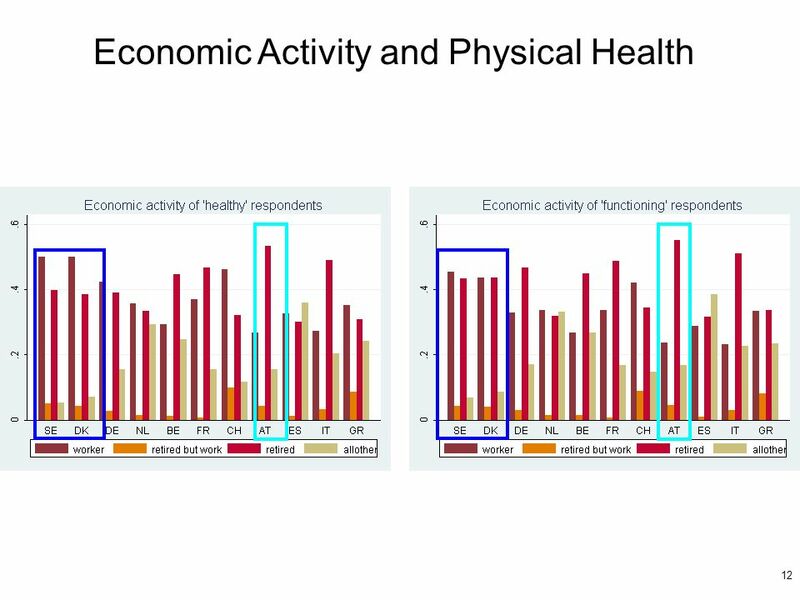 The stock of health today depends on past investments in health. 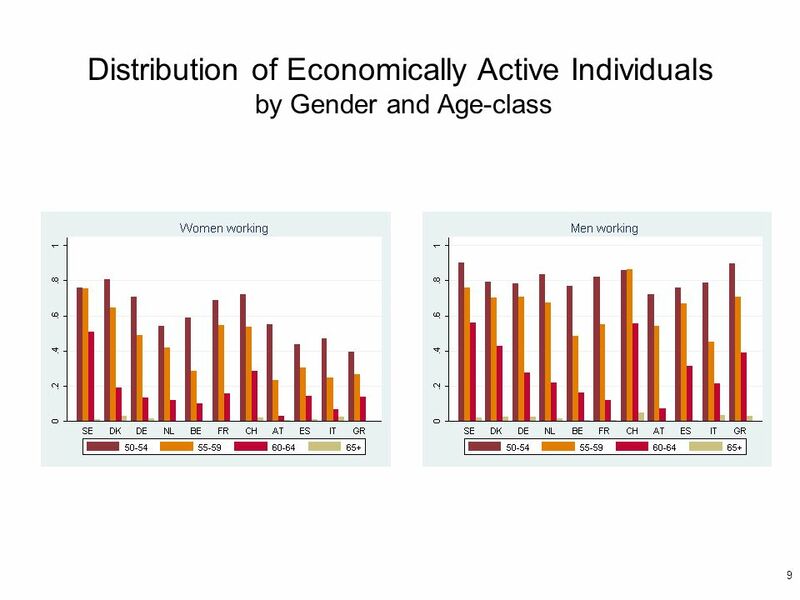 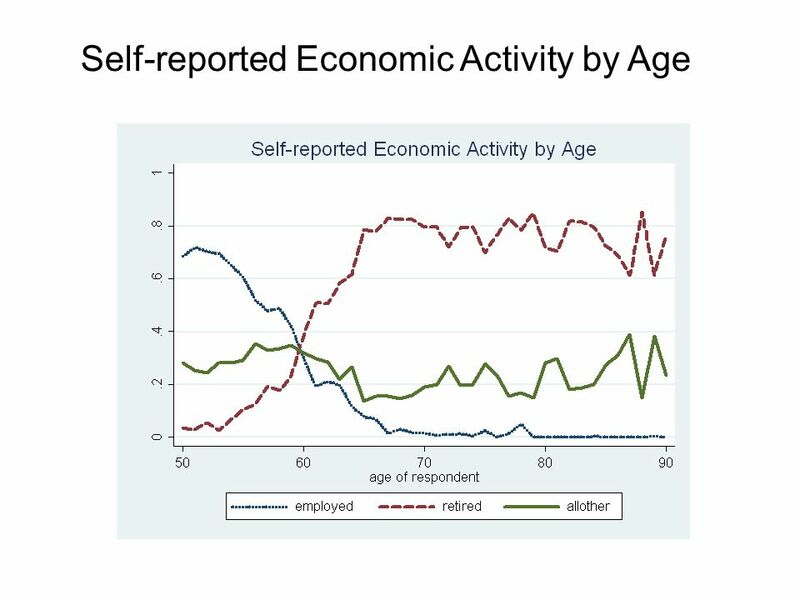 Non-market time is an input into both health production and the production of other valued non-market goods (e.g., leisure activities). 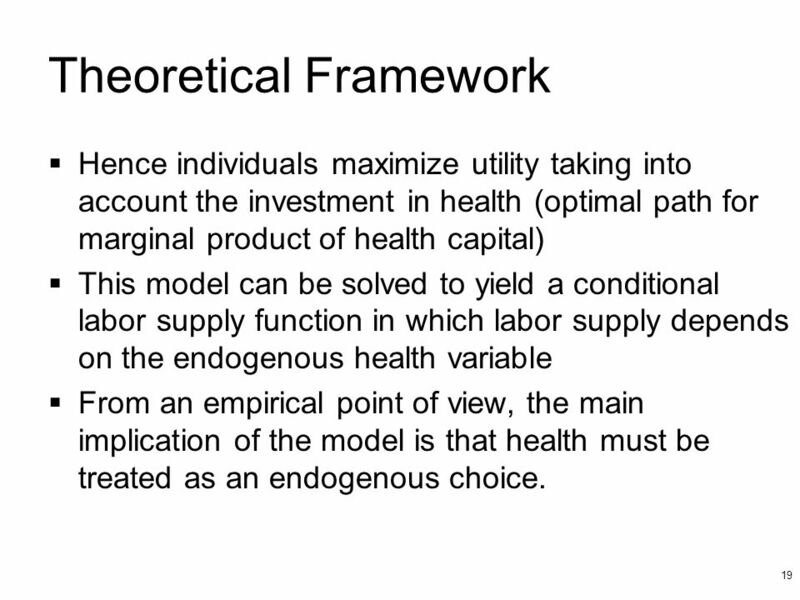 19 19 Theoretical Framework Hence individuals maximize utility taking into account the investment in health (optimal path for marginal product of health capital) This model can be solved to yield a conditional labor supply function in which labor supply depends on the endogenous health variable From an empirical point of view, the main implication of the model is that health must be treated as an endogenous choice. 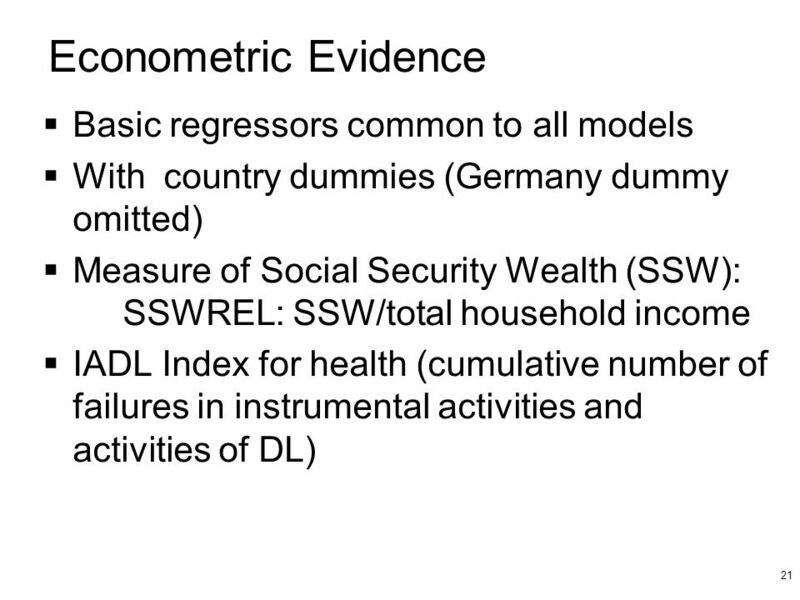 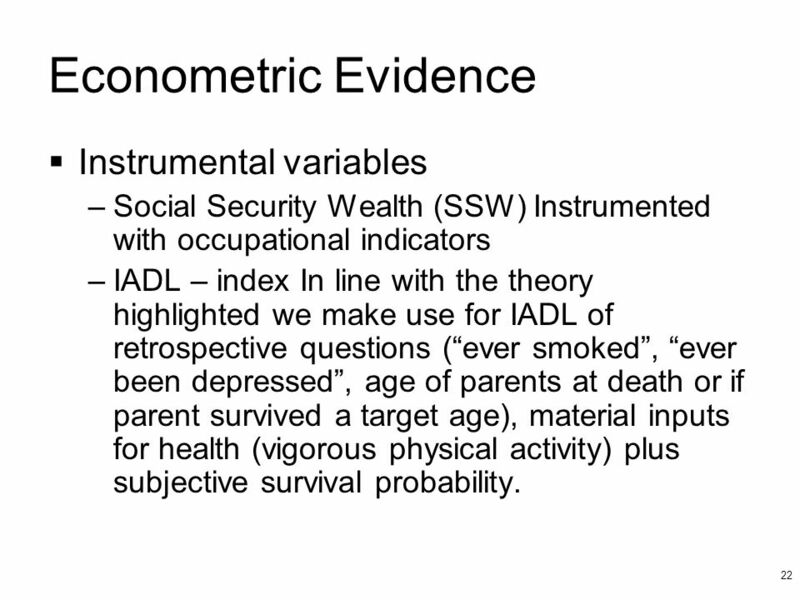 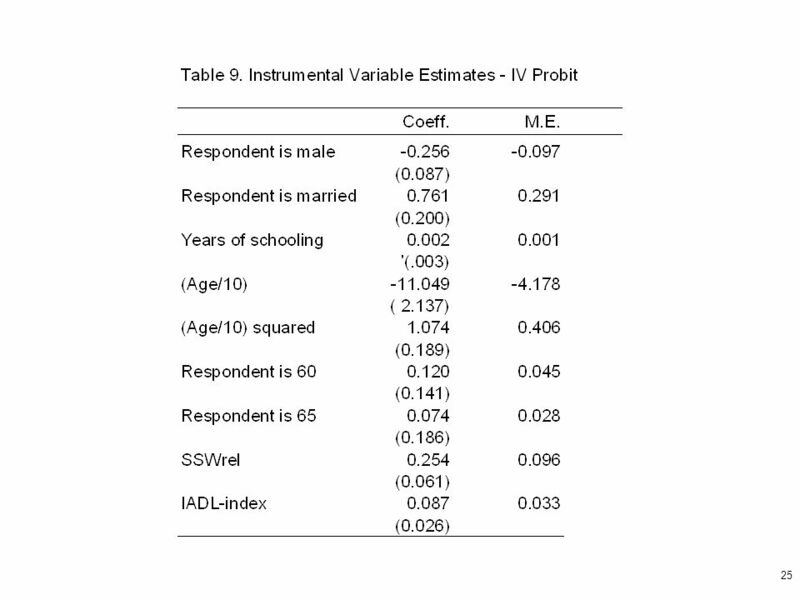 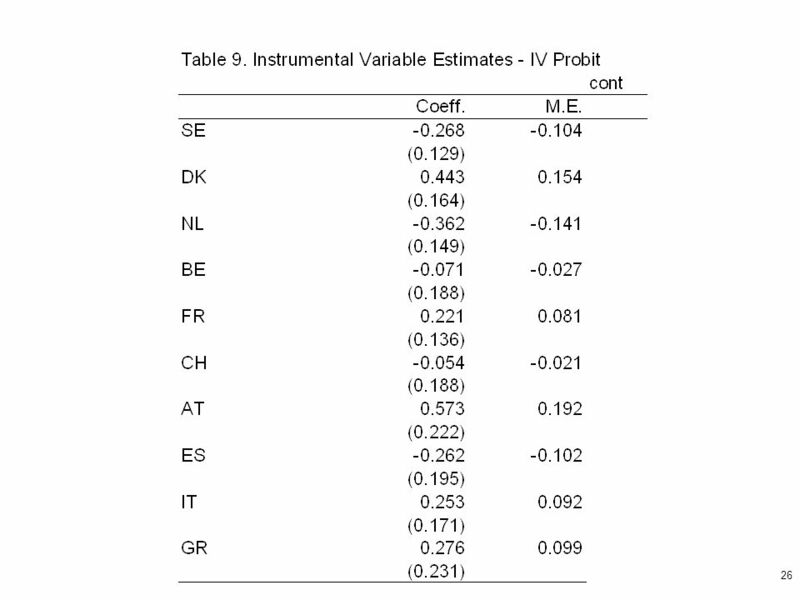 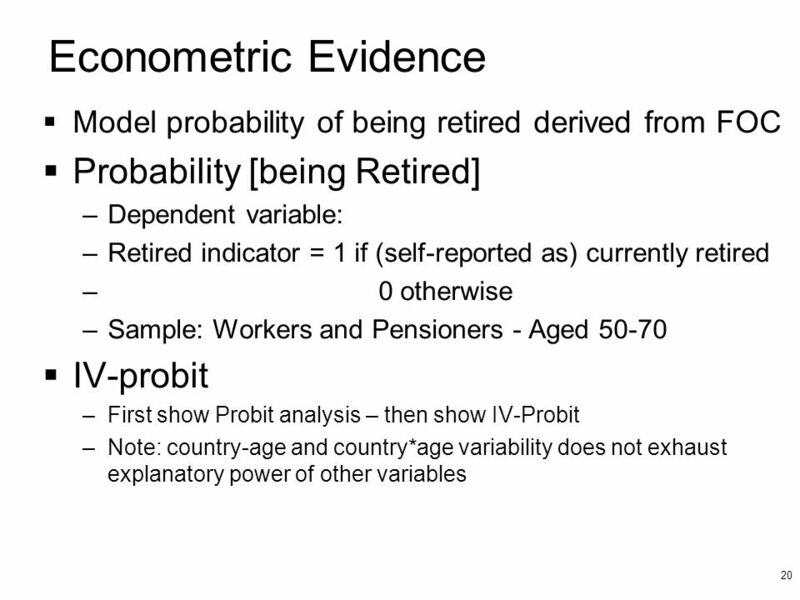 22 22 Econometric Evidence Instrumental variables –Social Security Wealth (SSW) Instrumented with occupational indicators –IADL – index In line with the theory highlighted we make use for IADL of retrospective questions (ever smoked, ever been depressed, age of parents at death or if parent survived a target age), material inputs for health (vigorous physical activity) plus subjective survival probability. 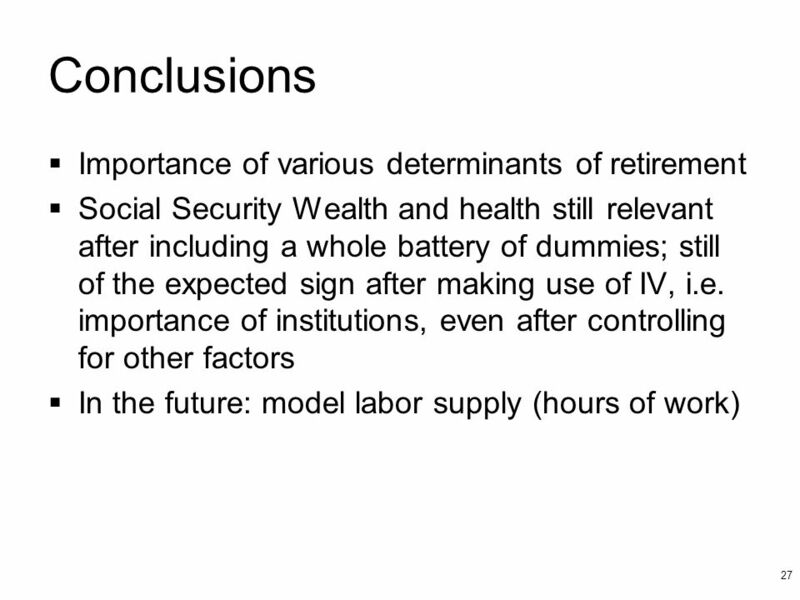 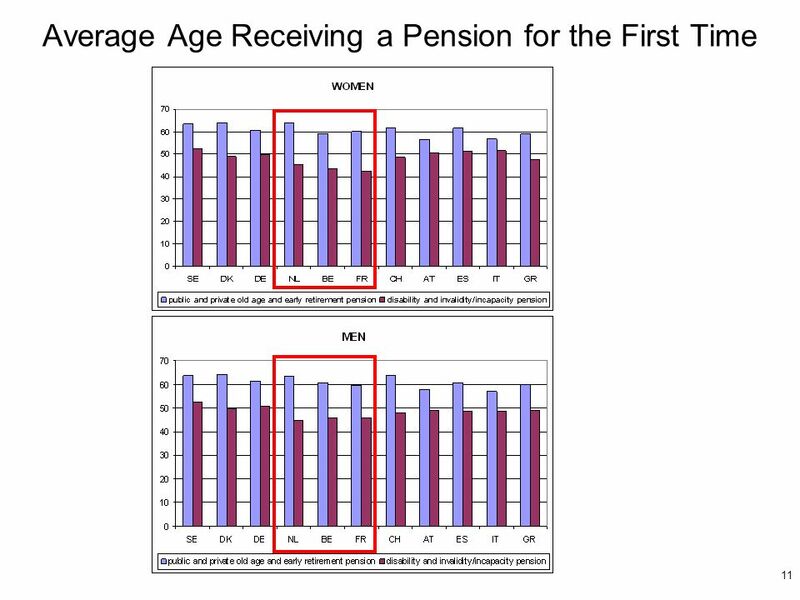 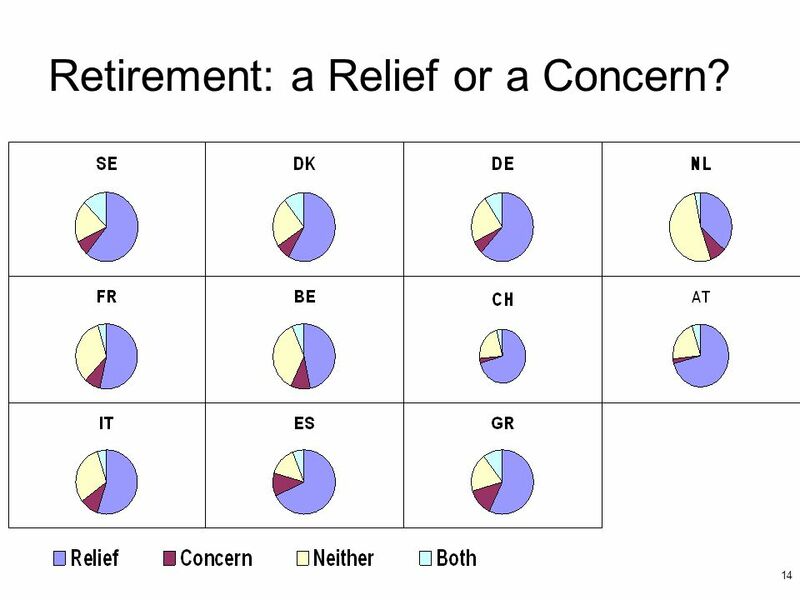 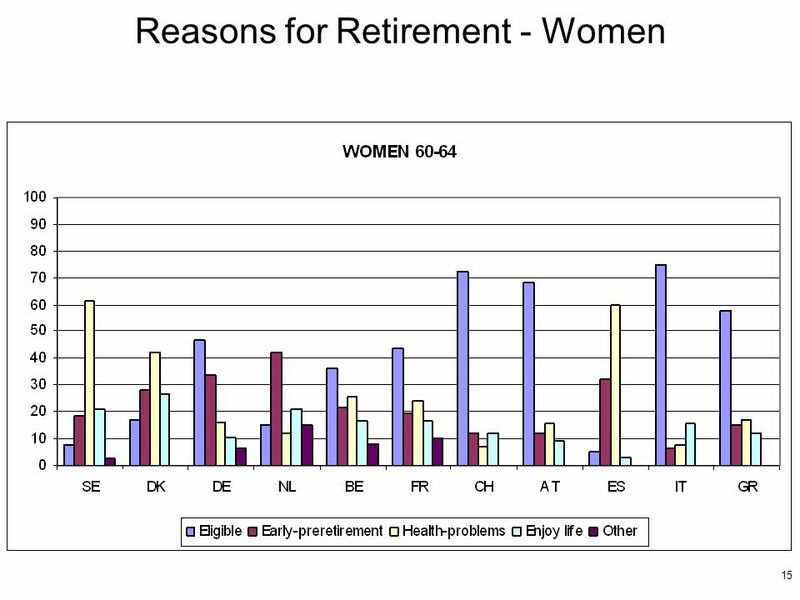 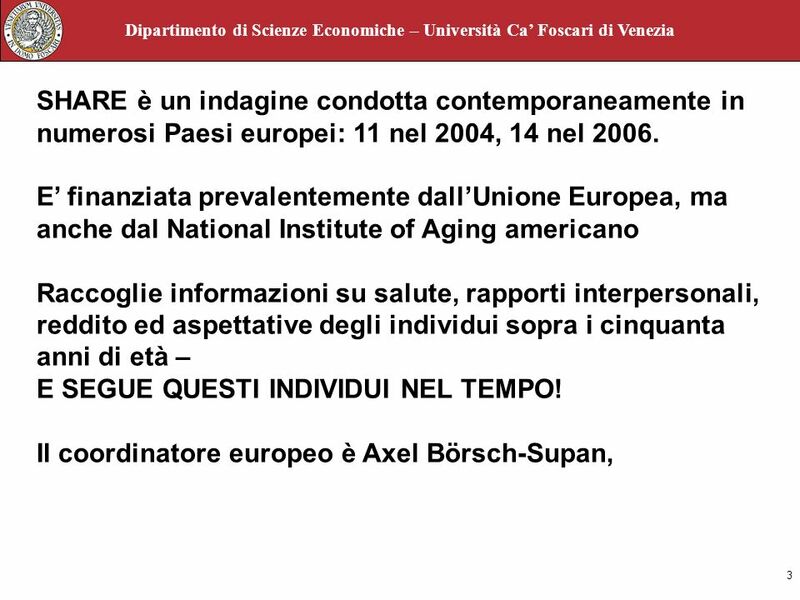 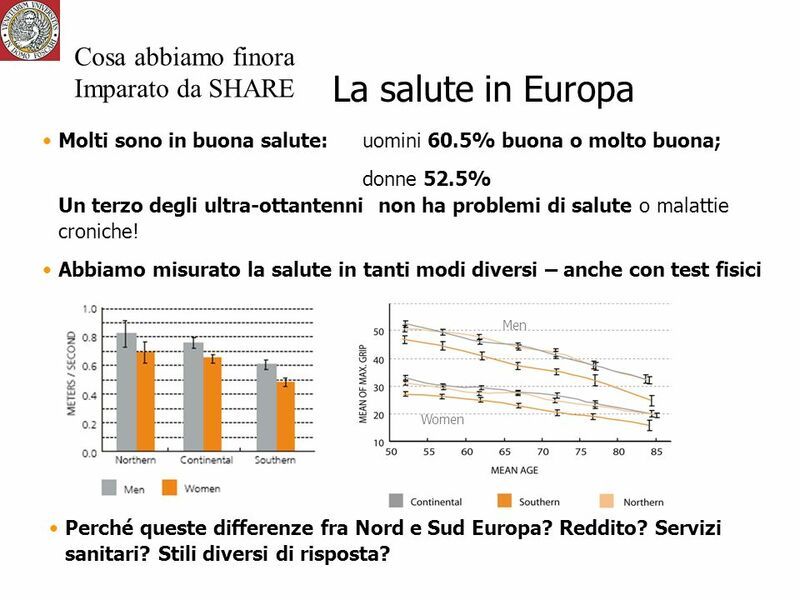 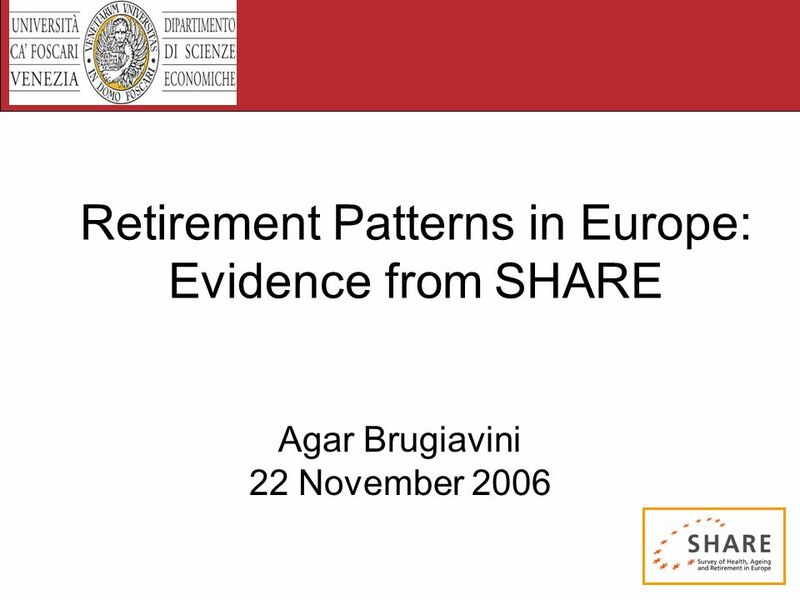 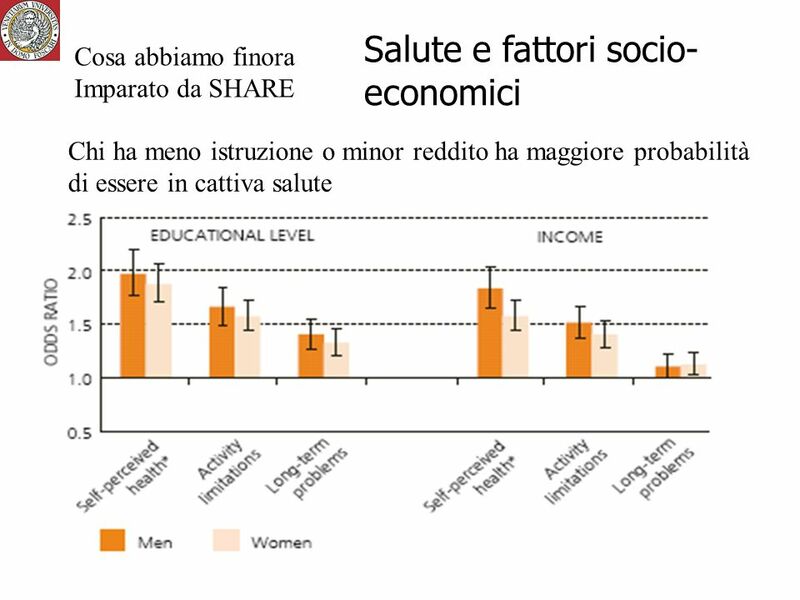 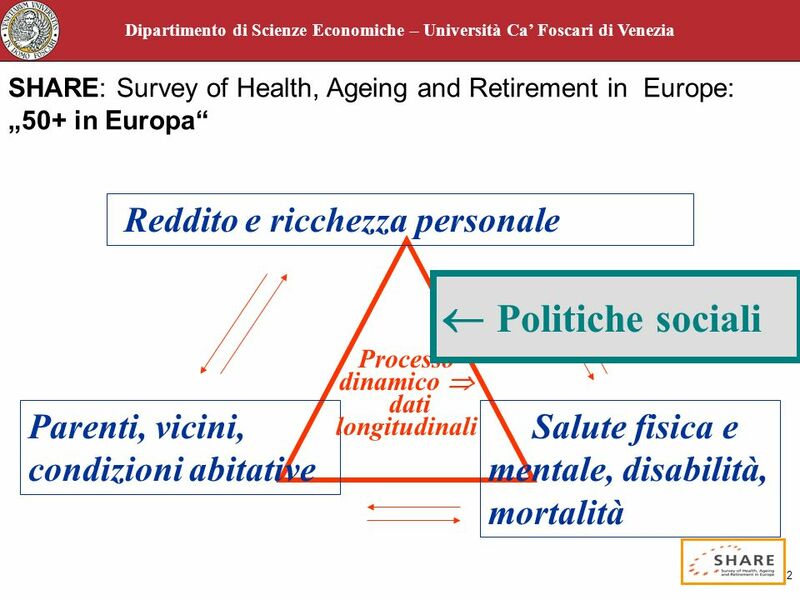 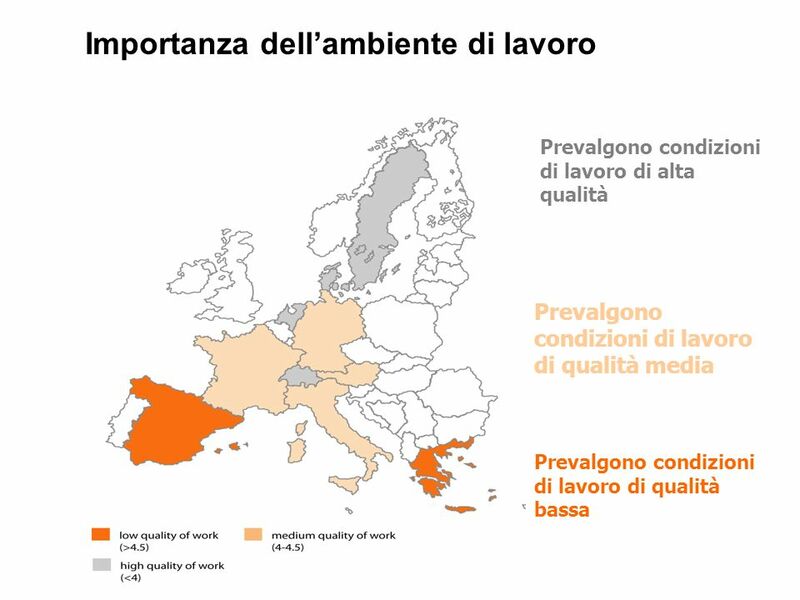 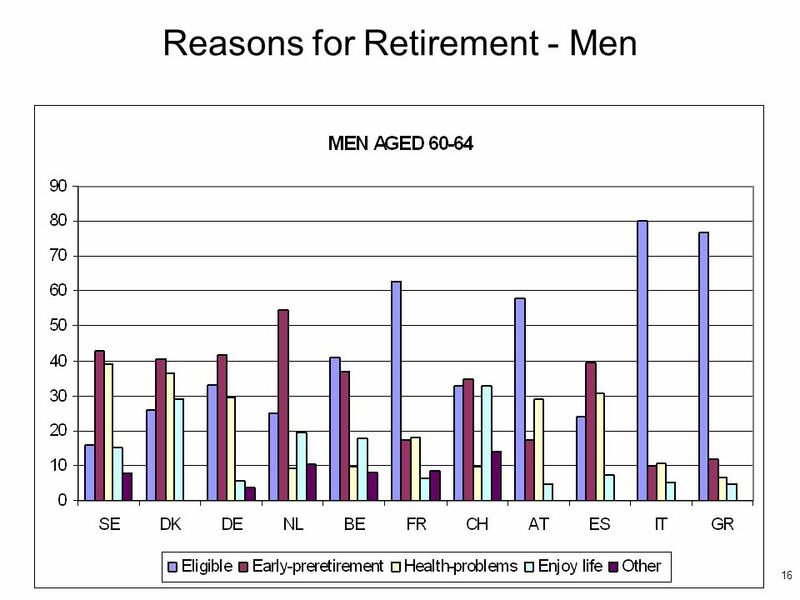 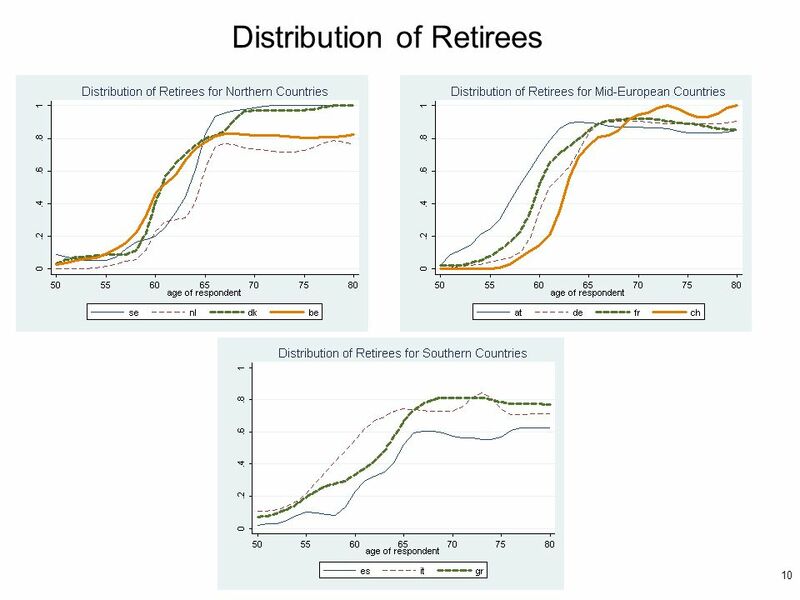 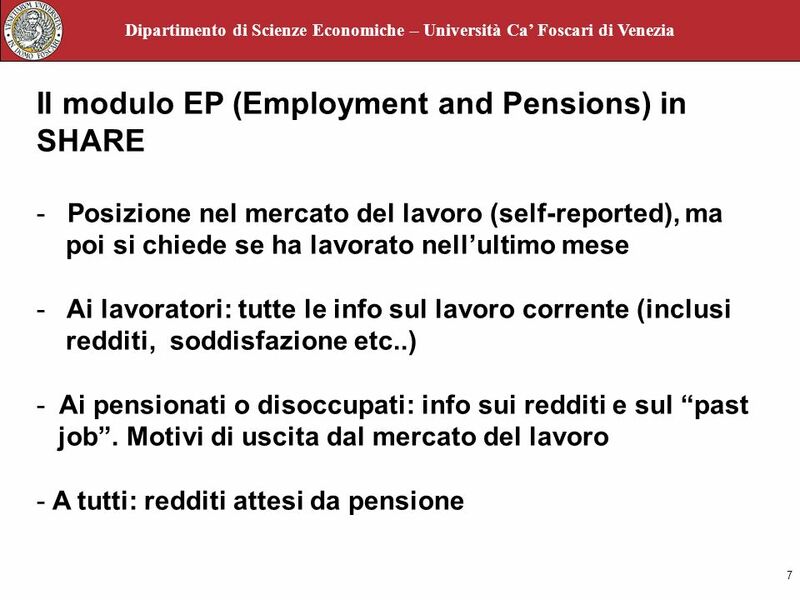 Scaricare ppt "Retirement Patterns in Europe: Evidence from SHARE Agar Brugiavini 22 November 2006." 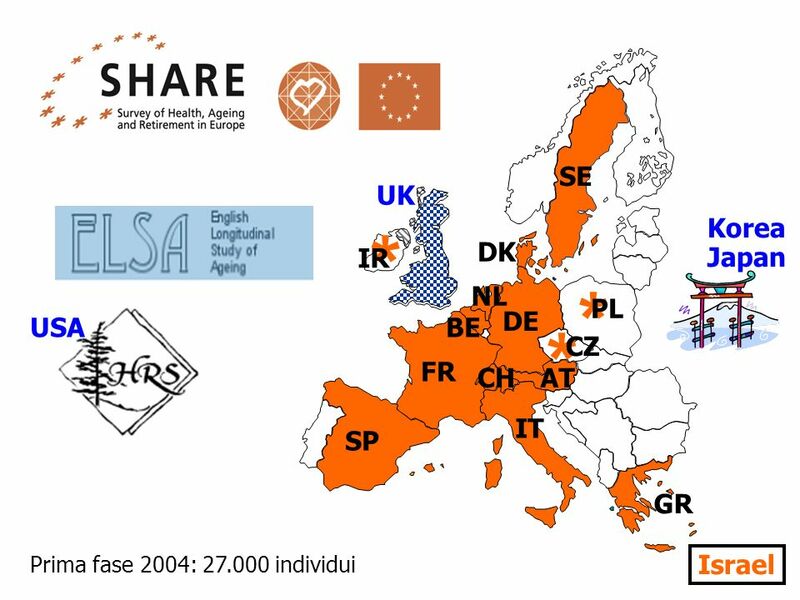 EMPOWERMENT OF VULNERABLE PEOPLE An integrated project.